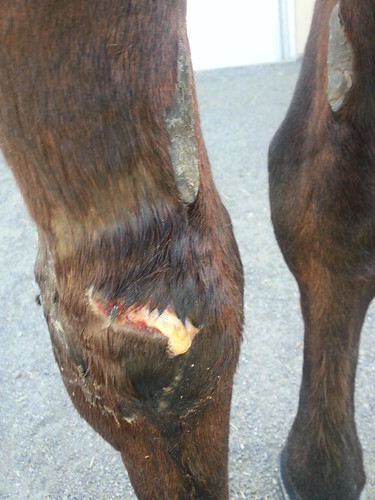 I did a chronicle on facebook of Truckee’s leg wound. I came home to this on April 20. Yep, already infected. 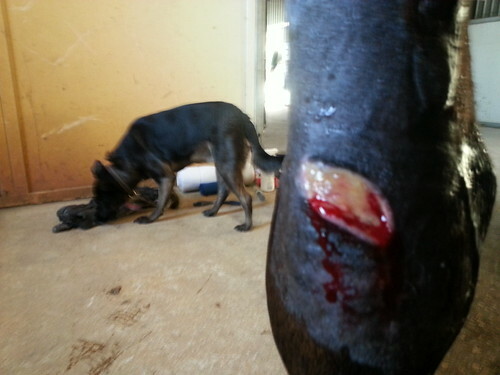 Got it cleaned up and had the vet out where we flushed it, xrayed it, got him on antibiotics and started to wrap it. Four days later all was looking well. 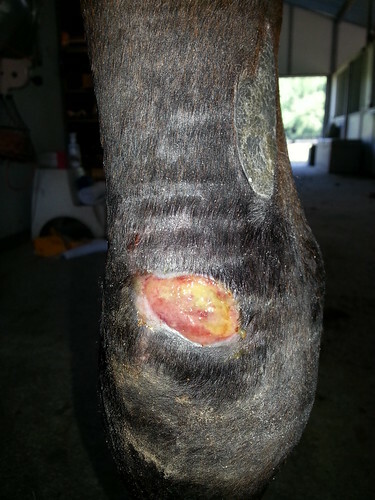 I wrapped it daily and he was on the heavy antibiotics but one morning I took the wrap off and immediately knew something had changed. Lots of drainage and it had opened a pocket up. Took him right up to New Bolton per advice of the vet for further ultrasounds and advanced work. 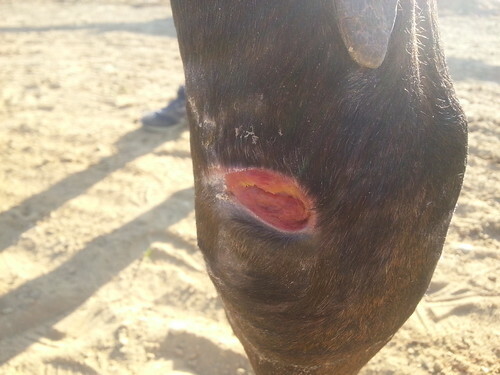 The ultrasound showed that the joints were not infected but the wound itself was septic and needed immediate care. It had a pocket in there that had basically healed over and now was an issue. He stayed at New Bolton for week where he received regional profusions. 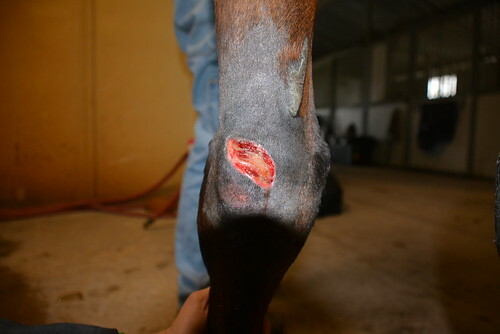 They tie off the leg above the wound and do IV injection of the antibiotic directly into the vein near the wound site and keep it tightly wrapped so that the medicine concentrates in that area. He received several of those treatments before coming home and once more once he got home. The good news is that he had been sound the whole time. I had him turned out on a very small paddock attached to his stall and he was wrapped daily. It began to slowly fill in over time. This is the last picture I have which is June 14 but you can see that it had filled in flush with the surface level. I need to get some updated pics because it is now almost completely gone. He will always have a bit of a raised profile there but he is sound and now back into work. He has been doing about 3 days a week of work and is jumping some jumps and staying sound. CANTER was very grateful for the emergency funding grant we received from After the Finish Line. Truckee managed to do about $3500 worth of damage in vet bills in a very short time. Truckee hates stall rest so I got him donkey friend 🙂 I mean really the donkey was for me but I am sharing with Truckee. 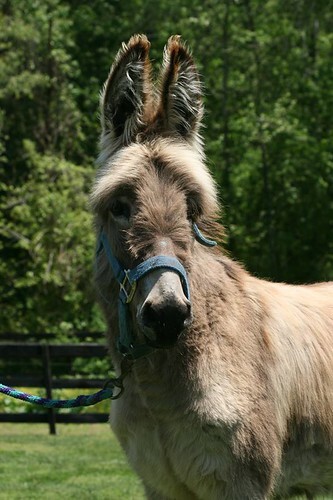 Oliver is absolutely the cutest donkey ever. Check out his face!!! I can’t tell you how much I love having a donkey. 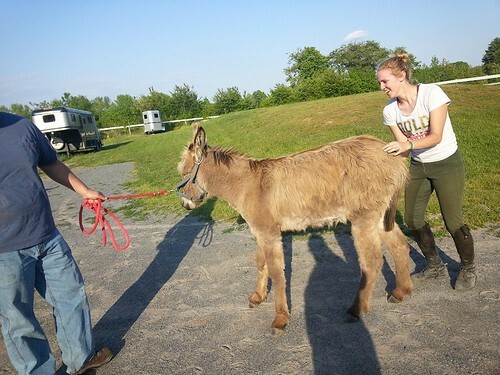 Allie had gotten her donkey and I was totally smitten and knew it was just a matter of time before I got one. Life had sort of done a big change and Ian and I had started talking about the future. I mentioned how much I wanted a donkey and the next thing I knew off we went to get this donkey. Then he told me the donkey was an engagement gift. 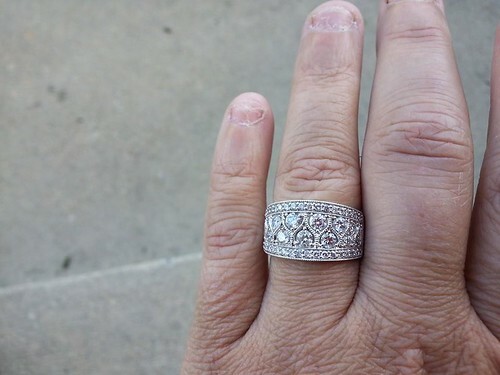 So basically this was an engagement donkey..how fitting 🙂 The ring didn’t happen until just this weekend but donkeys and diamonds go perfectly together! My loyal readers are probably going wait..um wait..what??? Yes, funny how life has done such an up and down. I said no way I would get married again..not a chance. Then I met this wonderful guy who lived about 20 min from me and has a lovely 300 acre farm which is mostly planted in crops. He works another job outside of the farm but the farm is his lifestyle for sure. He buys and sells farm equipment as well so he gets the passion for resale 🙂 He is as passionate about his farm equipment as I am about my horses. It was just one of those things when you meet somebody and it is like you have been with them forever. I honestly wasn’t at all ready for it and I wasn’t sure I wanted anything serious there for a while but you go with your gut and the gut said don’t blow it. Just don’t blow it. 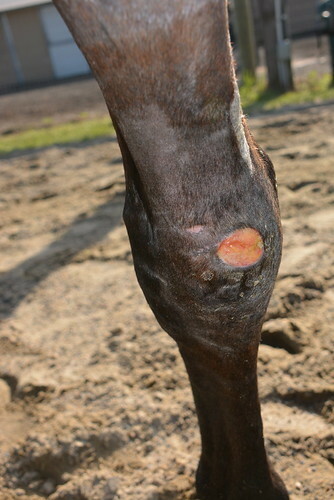 I have had to pull back from a lot of the work that I do with CANTER. That makes me sad but there just isn’t enough time in the day to get it all done and I am still working to get the farm into my own name so I have had to focus on reselling my own horses to create income. We sent most of the horses that were local up here down to North Carolina and they are being retrained and rehomed down there with amazing success. It is still super fun to watch them move along and I will be as involved as I can be. I think I may either create my own blog that acts as website of some sorts or something along those lines. I plan on doing some success stories here of all the CANTER horses and updating the new CANTER Mid Atlantic website with success stories. Never tell them they are sold!